Winter is almost upon us, and that means it’s time to start making all our favourite winter dishes! 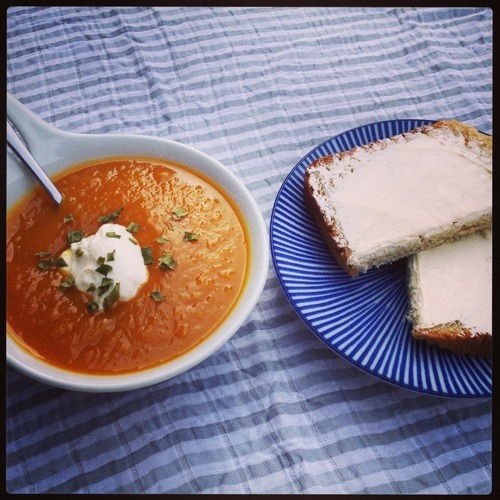 And what’s more of a favourite than good ol’ pumpkin soup? I must confess, I have only just been able to start eating pumpkin soup, and only if I make myself. I’m a big pumpkin hater from way back. My mother tells me that I used to love it as a baby, but I think that’s a myth. I bought a whole Kent pumpkin a month ago to cook up for Miss G who absolutely loves the stuff, but then it got shoved behind a stack of onions, a carton of eggs and 2 tubs of bread flour (yes, my pantry is weirdly organised), and I remembered it in a panic over the weekend when I received a whole Butternut in my fortnightly veggie box. And what do you do when you have too much pumpkin? 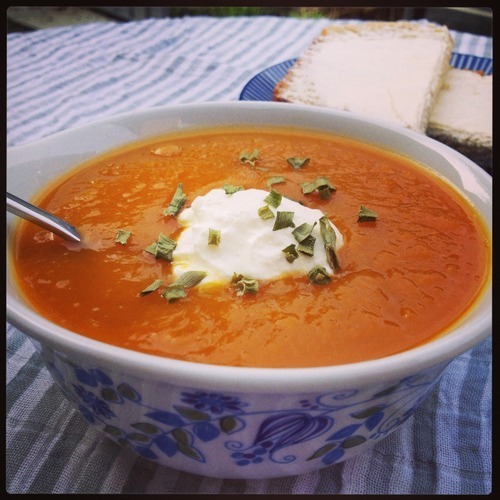 Make pumpkin soup! I wanted a simple soup; no fancy seasonings, not too many ingredients, and not time consuming. Most importantly, I wanted to use my slow cooker. I couldn’t find a recipe that suited what I was looking for, so I decided to create my own, and I couldn’t be happier with the results. Miss G absolutely devoured this! This soup has 5 ingredients. That’s it. Well, 4 ingredients and a seasoning if we’re going to get technical. It cooks in the slow cooker, so no stirring over the stove to prevent sticking or burning. And as it takes 12 hours to cook, you can make this in your sleep or whilst at work. How easy is that? The hardest part is chopping everything up at the beginning and pureeing it at the end. Add all ingredients to your slow cooker. Cover and cook on low for 12 hours, stirring after 9-10 hours to break up the pumpkin. Once cooked, leave to cool. Remove bay leaves and discard them. Puree soup in a food processor or blender in batches. Add extra stock or water if you would like a thinner soup. Alternatively, puree soup with a immersion/stick blender in the slow cooker and add more stock or water if required.